Today is election day, so we are going to cover voting and politics from an ETF perspective. First, a look at the incumbency of ETF influence on stocks. 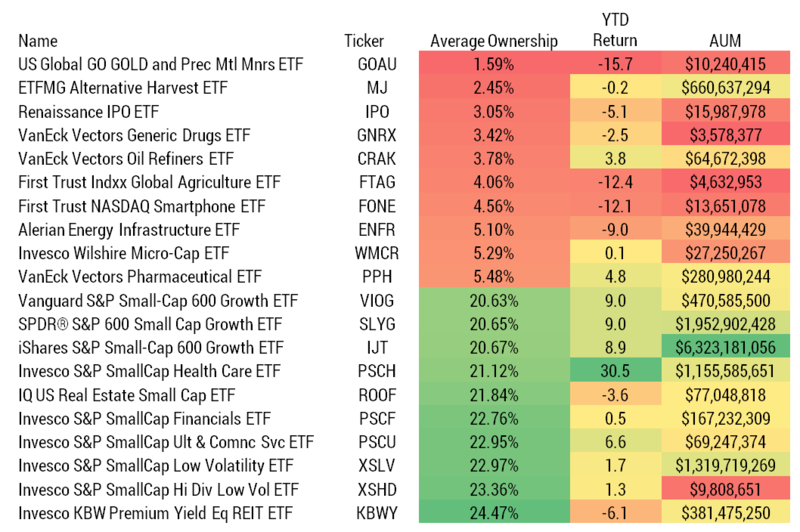 With the help of ETFRC.com, we examined the top ten ETFs with the most and least average ownership by ETFs. This matters because often the media highlight ETF growth as skewing the market performance without providing specifics. Matter of fact, coming out of the October decline, ETFs ownership extended its broad steady increase to a record high of 8.13% of every U.S. equity. However, to be fair, ownership across different segments do matter and is the reason why the TETF.index and its KPIs need to be monitored. As a result, we now drill deeper across segments. Second, we will compare two ETFs that focus on politics and explore how these ETF growth innovations provide investors different exposures. A few weeks ago ETF.com published a story about Tanger Outlets (SKT) and its passive ownership creeping toward 50%. 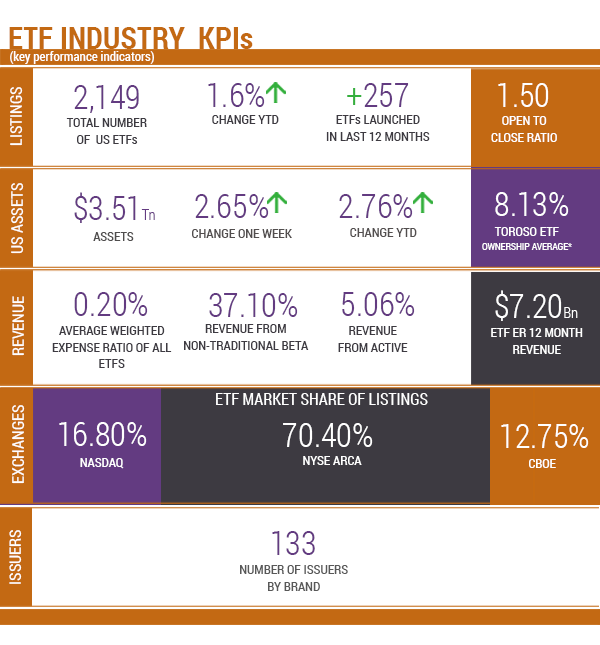 Within our ETFThinktank.com, we calculated that 32% of STK market capitalization is owned by ETFs. The implication is that ETF ownership can act like incumbency within an election and artificially prop up the value of securities. Our team has long maintained that ETFs are not responsible for the movements of broad indexes. However, the headline risk has often obscured the risk to certain subsectors where the passive vote has had significant influence. Below, we have listed the ten ETFs with the most and least ETF influence. 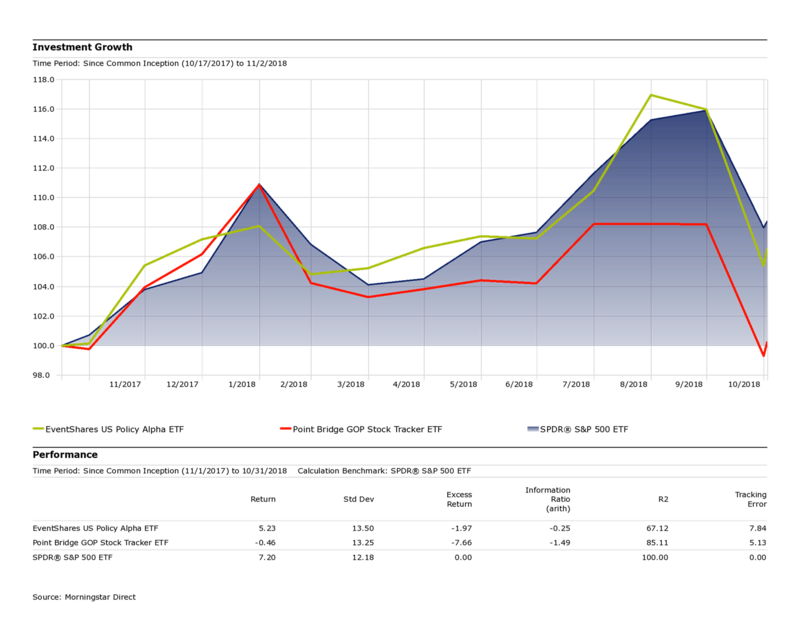 We defined ETF influence as the average weighted percentage of the market cap of underlying holdings owned by ETFs. The tables do show some patterns in that small-cap subsectors seem to have the most influence. The lowest influence is in unique themes like Gold Royalties (GOAU), Marijuana (MJ), and Smart Phones (FONE). That said, the active vote seems to be defining the performance. There doesn’t seem to be a connection between the ETF influence and returns. The themes and market cap seem to be driving the returns. Warren Buffet is often credited with this relevant quote, “In the short run, the market is a voting machine, but in the long run, it is a weighing machine.” ETF ownership within certain subsectors can skew the votes in the short run, but in the end, value is weighed and reflected in the performance. The truth is almost always realized, like the fact that the “Buffet voting/weighing” quote is actually from Benjamin Graham. 1. MAGA: The Point Bridge GOP Stock Tracker ETF tracks an index of US large-cap companies whose employees and political action committees are highly supportive of Republican candidates. 2. PLCY: The EventShares U.S. Policy Alpha ETF is an actively managed fund that takes long and short positions in US companies that the advisor expects to change in value due to US government regulations, trade policies, and fiscal spending. These are very different approaches with very different portfolios and returns. MAGA is passive and assumes performance can be gathered from political contributions. PLCY is active and changes dynamically to capture returns from subsectors where government policies are deregulating or expanding resources. Innovations like these are the key to continued ETF growth. We encourage all investors to be diligent in your research and understand what is under the hood in ETFs. ETF investing is about weighing the merits of theme, an index construction, or an active manager. Your allocation is your vote and should only be made after the ETF has been weighed. Thanks for reading, now get out there and vote! Returns as of November 5, 2018. As of November 5, 2018. Source: Morningstar Direct.